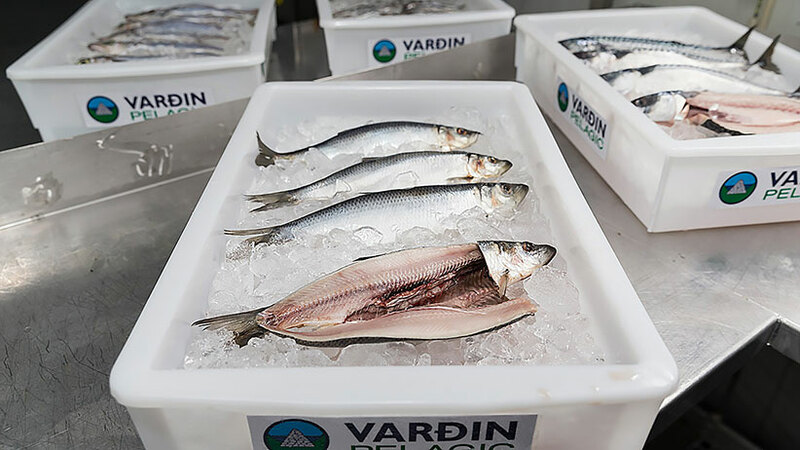 Food safety and quality of all products, both in the catch stage, the processing at Varðin, and in the finished product, has our highest priority. The factory has close contact with the ships, in order to develop the fishery and the quality. This is possible because all are part of the same association. Varðin has many experienced staff that work in quality control. Also onboard the ships there are people in quality control. Immediately when the fish is come onboard the ship, it is put into cooling tanks. Varðin is a very modern factory, which secures cooling during the whole production process. That means that from the time the fish come into the cooling tanks onboard the fishing ships, until it is frozen at the plant, all the time it is cooled to minus 1,5 degrees Celsius. The ships of Varðin have – together with the company Nótaskip – obtained MSC-certificate for sustainable catch of herring, mackerel, and blue whiting. This is important in showing that the fishery is continually sustainable. There is full tracking from the fishing area, till the fish comes for processing at the plant, and till the product is sent on to the customer. The Faroese Food, Veterinary and Environmental Agency conducts inspections and checks on the plant, in order to secure that the production meets all necessary requirements in accordance with the food legislation.